Travel back in time two thousand years. Imagine yourself in the Upper Room, sitting at the feet of the Master, the resurrected Christ, Jesus of Nazareth. Bask in the radiance of his materialised presence. Hear his illuminating words, given then to a few disciples. Receive his inner teaching, the true meaning of his resurrection into the light body, the spiritual or ascended form of his I Am Self. So it is now. This book reveals the sacred wisdom that Christ Jesus imparts to all who are ready to follow his pattern in re-evolving into cosmic consciousness. Inside are the keys you need to understand, and to prepare for, the demonstration of your own immortal, etheric, fourth dimensional, resurrected, light body. The time is ripe. In these Latter Days, light workers throughout the planet are undergoing a spiritual regeneration that will lead all mankind into the fourth dimension, a new heaven on a new Earth. We are preparing the force field for the redescent of our planetary way shower, Sananda, in his light body as Christ Jesus. Co-partners in the Second Coming, we are called to anchor our light bodies on Earth in order to lift mass consciousness for this prophesied event. As we ascend, Sananda descends. In the Upper Room of your consciousness, the resurrected Christ, your own I Am presence, awaits you. Seated at the feet of the Master - and at the feet of all ascended beings ready to instruct you - open your mind and heart to the adventure of a lifetime: anchoring your light body on Earth! 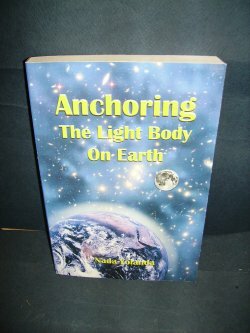 The book presents the esoteric teachings and inter-dimensional communications of Nada-Yolanda, cofounder of Mark-Age. N.B. Crease to bottom corner of front cover. 344pp.